State-Local Tax Burdens — How Does Yours Compare? Which states have the heaviest tax burdens? The lightest tax burdens? And where does your state rank? Residents of New York tote the heaviest tax load. Residents of the Empire State paid an average of 12.7% of their income in combined state and local taxes, according to the latest annual compilation of combined state and local tax loads by the nonpartisan Tax Foundation. Net income that remains after taxes impacts people’s financial planning in general and can impact retirement planning in particular. The data is for fiscal 2012, the latest year for which the foundation has crunched the numbers. The U.S. average tax burden was 9.9% of income. That averages $4,420 per American, down from 2007’s average of 10.1% and $4,731 per capita. New Yorkers’ 2012 tax burden worked out to $6,993 per capita for residents. Alaska has the smallest tax burden, taxing 6.5% of income, or an average of $3,229 per resident. The other nine states with the lowest tax burdens were South Dakota and Wyoming at 7.1%, Tennessee at 7.3%, Texas and Louisiana at 7.6% each, New Hampshire at 7.9%, Nevada at 8.1%, South Carolina at 8.4% and Mississippi at 8.6%. 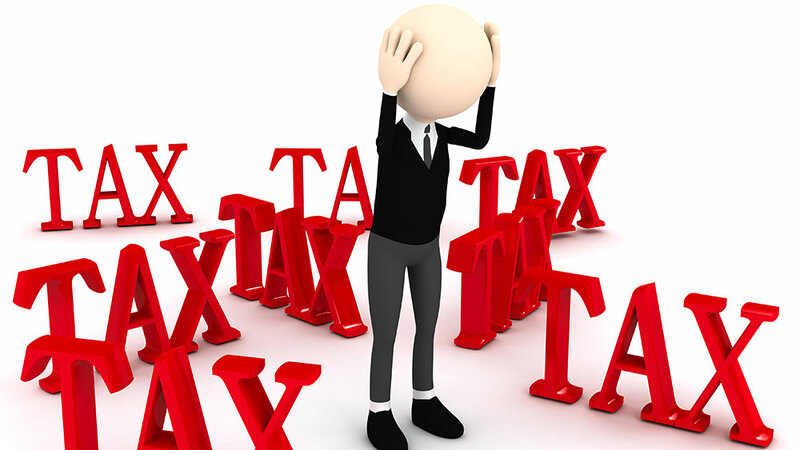 The Tax Foundation’s calculations include sales tax, property tax and local income tax, so even states with zero state income tax end up collecting some taxes. A state’s tax burden is the portion of total state income that goes to state and local taxes. It reflects not only tax payments residents make within their own states, but also tax payments to the governments of states and localities in which they don’t live but do spend money or incur taxes. 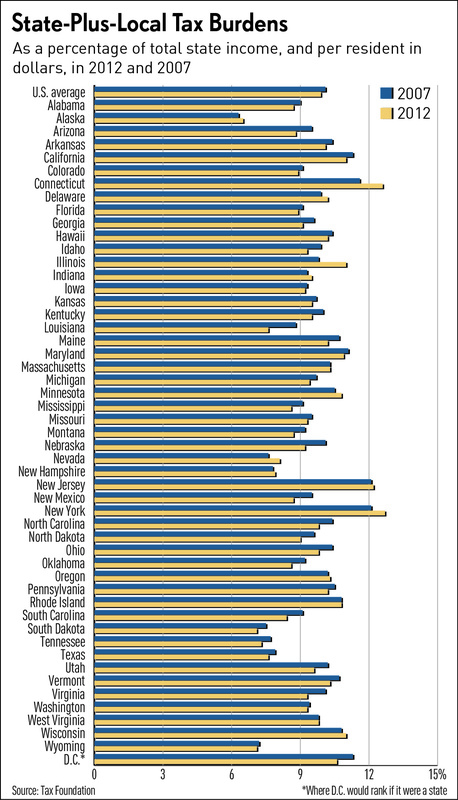 Fourteen states moved higher in the rankings of percentage of total combined tax burdens between 2011 and 2012. Alphabetically, those were Arkansas, Delaware, Georgia, Hawaii, Illinois, Indiana, Kansas, Maine, Massachusetts, Missouri, New Mexico, Oregon, Virginia and Wisconsin. So did D.C.
Fourteen states’ percentage tax burdens declined. Those were California, Florida, Idaho, Iowa, Minnesota, Montana, Nebraska, North Carolina, North Dakota, Ohio, Rhode Island, Vermont, Washington and West Virginia. Declines like those reflected economic growth rather than political decisions to lower taxes. “Average income increased at a faster rate than tax collections, driving down state-local tax burdens on average,” the Tax Foundation said in a release. New York has held the dubious distinction of levying the heaviest combined tax load every year since 2005. It tied with New Jersey for the top spot in 2007. Previous calculations were done every five years. New York was also No. 1 in 2000, 1995, 1990, 1985 and 1977. In 1980, only Washington, D.C., had a higher burden.